We are delighted to introduce our wonderfully talented crew. Scroll to read profiles. View full list of the crew. From searing reportage of some of the world’s conflict zones and artistic odysseys; to a few over’s of cricket with the Taliban. 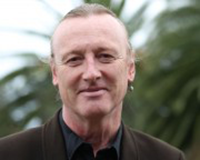 New Zealand based Bryn Evans is a director and writer of documentaries that focus on civil conflict, human rights, and Indigenous Issues. For over 15 years, his passion to expose injustice has formed the foundations of his work as both a photographer and now a filmmaker; these are the subjects that fuel Bryn’s desire to tell stories. Hip Hop-eration is his first theatrical documentary release. Paula has worked in television (TVNZ) and film both behind and in front of the cameras and trained and mentored over 1500 graduates in the film and television industry. She’s well known to a whole generation of fresh young Kiwi filmmakers but Hip Hop-eration is her first feature film as a producer. A feature film had been on her ‘bucket list’ for some time. 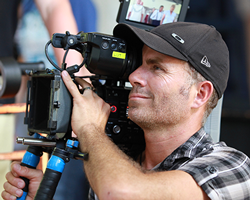 Bevan has worked in the television industry as a Cinematographer and Camera operator for 16 years. His career has taken him all over the world He began his career at South Pacific Pictures ‘Shortland Street' in both camera and lighting then moved to TVNZ Camera Production department. In 2004 he made the leap into the Industry as a freelance cameraman with the goal to expand his knowledge and experience in cinematography in the art of Cinematography. Since then he has continued to work on a range of series including Short Poppies, The New Old, Intrepid Journeys and the South Pacific Pictures series ‘Rivers’ with Craig Potton. Hip Hop-eration is his first feature film. Alex is the Head of Department of Performing and Screen Arts at Auckland's Unitec Institute of Technology. A practicing media lawyer and filmmaker, Alex worked in Asia Television Limited (Hong Kong) as a writer and presenter. 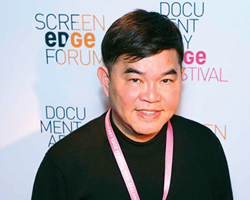 Currently, he is Deputy Chairman of Film Auckland and is a member of the Auckland Screen and Digital Content Sector leadership group, and director of Creative Coalition, Asia NZ Film Foundation and Oryza Foundation for Asian Performing Arts. Alex founded the Documentary NZ Trust which runs the Documentary Edge Festival (Australasia's premiere international competitive documentary festival), Screen Edge Forum and DOC Lab. Peter Roberts has worked in the film and TV industry for almost 40 years. Originally from England, Peter arrived in New Zealand in 1986, and currently owns and runs RPM Pictures, a boutique post-production house in Ponsonby, Auckland. Billie has a background in Public Relations and Marketing but taking twenty-seven senior citizens to Las Vegas proved her biggest challenge yet. From late night phone calls to toenail cutting, she has became their friend and confidante, their caregiver and business manager. It means there is little time for a real job but she loves it and they have become the family she never had. In November this year she’s taking them to Taiwan to perform to fourteen thousand people in the Taipei Stadium. It is with the greatest pleasure to introduce some of our extraordinary cast. In 1984 Maynie joined Kara and four other women from Waiheke Island at the Greenham Women’s Peace Camp where she was involved in cutting the fence and raiding the military complex. Two years later she took part in the Great Peace March across America, walking from Los Angeles to Washington in a call for peace. In 1995 she took part in the ‘Peace Flight to Tahiti’ protesting about nuclear testing in the Pacific. Maynie has five children. Her husband left her after the birth of her fifth child. She says “It was probably the best thing that happened to me." Kara is well known on Waiheke Island as a teacher and Peace Activist. Born in Manchester England, she moved to Toronto, Canada before coming to live on Waiheke Island in 1964. A ‘straight shooter ‘and fearless, she was 60 when she went to Greenham Common Peace Camp with Maynie Thompson to protest against Nuclear missiles on British Soil and 90 when she did her first tandem parachute jump. She was actively involved in New Zealand’s anti Nuclear campaign and, along with Maynie, became the subject of the documentary ’Tea, Scones and Nuclear Disarmament.” Kara plays the piano, viola and recorder and sings in a local choir. She doesn’t like Hip Hop Music but enjoys the dancing. London born, Terri has been married for seventy-three years to her first and only love, Bill. In her early thirties she had a bilateral mastectomy and eleven months later she gave birth to he first child. While Terri remains on Waiheke Island Bill, now lives in a rest home in Nelson where she visits him regularly. Terri has had two hip replacements and both knees replaced simultaneously under local anesthetic. She was a volunteer for the Cancer Society in Canada for many years and a Field Officer for the Canterbury/Westland division of the NZ Cancer Society for 15 years. She has seven grand children and four great –grand children. 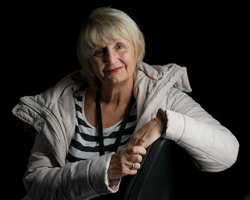 Terri believes in euthanasia, is not afraid of death and hopes that she and Bill "Can be together at the end."